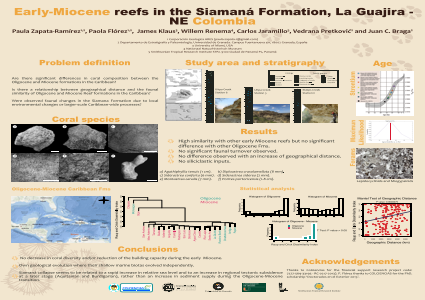 Abstract: We studied two reef sites (Arroyo Ekieps and Arroyo Uitpa) in the Siamaná Formation in the Guajira Peninsula, Northern Colombia. Our preliminary results indicate that: i) The reefs are composed by 28 species of zooxanthellate corals, included in 16 genera and 12 families commonly associated to shallow environments and to patch and fringing reefs. There are four species of Montastraea and Porites, three species of Astrocoenia, two species each of Agathiphyllia, Diploastrea, Siderastrea, one species each of Acropora, Alveopora, Antiguastrea, Astreopora, Colpophyllia, Goniastrea, Goniopora, Heliopora, Millepora, Stylophora and one specimen of the Caryophylliidae family. Arroyo Ekieps has a higher richness (25 species) than Arroyo Uitpa (9 species). ii) There were low levels of siliciclastic input in Arroyo Uitpa and no significant input in Arroyo Ekieps. iii) The presence of larger archaiasinids , Miogypsina sp. and Amphistegina ssp. suggest an early Miocene age for both sites. iv) Raup-Crick Similarity Index shows a high similarity to early-Miocene reefs in Mexico, Florida and Venezuela. Further research effort will be focused on dating more precisely both sites of the Siamaná Formation. Summary: Coral reefs extensively developed during the late Oligocene and decreased substantially by the early Miocene, being mostly confined to shallow or siliciclastic. How these changes took place is still an open question. We are investigating the sedimentology and coral taxonomic composition of Oligo-Miocene reefs in the Siamaná Formation, located in the Guajira Peninsula, North-eastern Colombia.